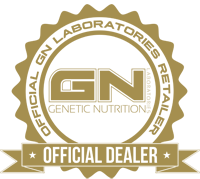 Produktinformationen "Dedicated Nutrition Re-Grow 90 Kapseln"
It is the unique combination of the highest quality natural exclusive compounds and extracts at the highest dosage possible, that is the secret to why RE-GROW™ is such an extremely potent product. RE-GROW™’s ingredients all work together in perfect synergy towards relaxation, deep REM sleep, vivid dreams, stress relief, cortisol control, growth hormone release and thus optimal recovery. Because optimal recovery is vital for maximal performance, but unfortunately often neglected. Quality of sleep and thus optimal recovery is often the missing link for athletes that want to achieve the next level or are stuck on a plateau. A deep sleep, every single day, will allow you to recover and make gainz like never before. Take 2-3 capsules 1 hour before going to bed. Initial dosage should always be 1 capsule to asses tolerance. For optimal results, always use in conjunction with other DEDICATED™ products like FUSION PRO™, BCAA SENSATION™, JOINT™, EPIC™ and PACK™. This Indian herb contains many active ingredients that are responsible for its incredible usage for athletes. Its main benefits are decreasing cortisol, stress, anxiety, increased feeling of well being, deep sleep, relaxation and even fat burning. RE-GROW™ uses the world’s finest ingredients and extraction technologies, which is why only the world’s best Aswaghanda KSM66® is used. A traditional Indian herb that has been used for thousands of years as well and one of the true stars of RE-GROW™. Well known for its L-Dopa content. L-Dopa is an extremely potent neurotransmitter which can trigger massive Growth Hormone release and deep REM sleep. L-Dopa, when taken in herbal or synthetic form, cannot cross the brain barrier rendering it completely useless. For this reason alone we engineered our Velvet Bean to contain a full spectrum extract which does cross the brain barrier. This unique aspect is absolutely vital in getting any kind of results from L-Dopa and it’s something you will feel from the very first time you try RE-GROW™! Related to the herb Coriander, this extract has well documented sleep quality increasing and prolonging properties. The Chamomille flower is also one of the world’s most popular anxiety reducing products. Also known as Lemon Balm and part of the Mint family. This herbal extract is known for decreasing anxiety and feelings of stress through reducing the breakdown of natural GABA. The specific lignans found in this Chinese tree are very effective in increasing sleep duration and quality whilst reducing anxiety. The natural 5-HTP content of this extract is globally used to increase quality of sleep and serotonin levels. Rounding off the RE-GROW™ formula, we included this extract to enhance bio-availability and thus increase potency and half life of every other ingredient. 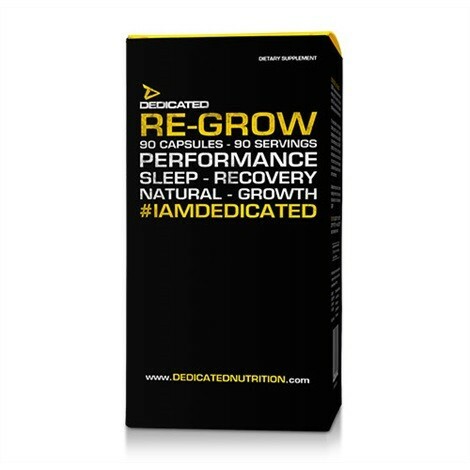 In true Dedicated Nutrition spirit, RE-GROW™ contains a fully disclosed formula. We do not have to hide behind fancy “proprietary blends” that basically do not tell the truth about actual ingredients and dosages. By actually controlling the cultivation of our own ingredients, we at DEDICATED can guarantee an industry leading standard untouchable by anyone else. We also guarantee a constant quality with each and every batch, something that is unheard of as well with any herbal formulation available today. As optimal sleep is a vital component of any athlete’s well being and performance, we choose to develop an all natural formula leaving out potentially harmful, habit forming, sleep disrupting and addictive ingredients such as GABA and Phenibut. These synthetic compounds are also extremely poor absorbed and thus not very effective. Being an all natural formula also means that RE-GROW™ can and should be taken every day without any risk of becoming dependant like most products. This is a key element in RE-GROW™’s formula as optimal sleep is meant to be healthy and not a drug induced state! Only when we sleep does our body release incredible recovery and performance enhancing hormones like Testosterone and Growth Hormone. Make the best of your performance by making the best of your sleep. It’s time to Recover-and-Grow. RE-GROW™. Weiterführende Links zu "Dedicated Nutrition Re-Grow 90 Kapseln"
Kundenbewertungen für "Dedicated Nutrition Re-Grow 90 Kapseln"